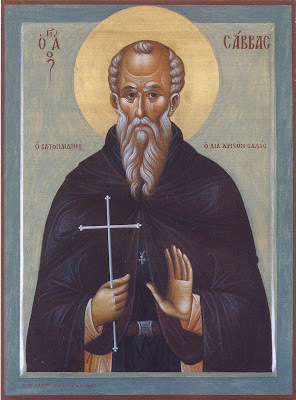 "The Heavens Above Have Opened"
Saint Savvas was born around 1283 in Thessaloniki, the son of virtuous parents, who eventually became monastics. His name in the world was Stephen. Having received his education in his native city and learning to love virtue, at the age of eighteen he secretly left his family and went to the Holy Mountain of Athos, where he subjected himself to a strict elder who lived at a cell of Vatopaidi in Karyes. There he was tonsured and took the name of Savvas. Patiently he endured the rigorousness of his elder and the difficulties of chastity, hunger, thirst, vigils, standing and unceasing prayer. And Savvas loved his elder for his strictness, for he considered him to be a sure guide to salvation. His asceticism and his virtues soon made him known among his fellow-monks. Because of his great humility he refused the priesthood. However his fellow monks would not listen to him, so he hid from them on the day of his ordination in a place they surely would not be able to find him. And due to his great brotherly love, whenever he went on a long journey with a brother, he would carry on his shoulders whatever his companion carried. In 1308, after the raids of the Catalans, which caused great upheaval, not only in Thessaloniki, but also on Athos, Saint Savvas with other monks at first went to a monastery dedicated to the Theotokos in Thessaloniki, but not wanting to be responsible for the cares of his family, friends and acquaintances he left for Limnos, Lesvos and Chios, and settled in Ephesus of Asia Minor. After visiting Patmos and other islands, he left for Cyprus, where after fervent prayer he decided to undertake the difficult path of foolishness for Christ, so he wandered naked and homeless, silent and hungry. Dead to the world, he practically starved himself, eating wild greens only once a week. He had no mattress, shelter, clothing, friendship and acquaintance. Exposed to heat, cold, storms, rain, wind, wild beasts, reptiles, and deprivation, everyone wondered how death never visited him. For this reason he was looked upon with awe by the angels, and hatred by the demons. Many considered him insane and they disdained him and removed themselves far from him. Though some indeed began to respect and honor him, suspecting a secret struggle and holiness. Some misunderstood his intentions, which caused them to revile him and beat him. But Savvas had wonderful forgiveness, and he considered all these things as instigations of the demons. Often the devil tried to tempt him with pride due to his ascetic achievements, but the humble worker of the gospel could not be persuaded. Once he came to a papal monastery while they were eating, but he left beaten and bloodied because they considered him an imposter. Soon however the virtues and holiness of Savvas became known to the Cypriot people, and they even considered him a saint while he was still alive. This honor very much bothered the man of God, just as dishonor would bother an ordinary person, so he decided to leave Cyprus with a heavy heart. 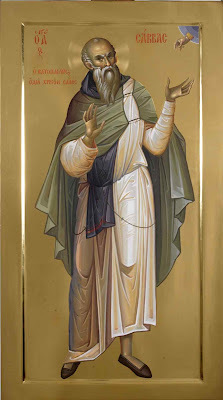 Savvas decided to make a pilgrimage to the Holy Land and visited Sinai, where he lived the ascetic life for two years, and he went back again to Jerusalem, where he remained for a considerable time in a hermitage beyond the Jordan, leading a life of great austerity and amazing all who came in contact with him by his virtue and holiness. Fearing the glory of men he secretly departed for the inner desert, where he could undertake greater asceticism and be served by the angels. There he faced terrible temptations that brought him near death, but angels appeared to him and there was divine consolation. Christ even appeared to him for the second time in an ineffable light, which brought him the greatest joy. He entered the Lavra of Saint Savvas the Sanctified, where he quickly became known and revered by the brotherhood, and many from all over came to visit him and receive his blessing and counsels. He remained unruffled in silence and prayer however. And he firmly resisted every demonic plot, to the point that he fasted for forty days entirely without food and standing in vigil, which according to his biographer made him look like an unmovable statue. There he saw Christ for the third time in ineffable light and was filled with unspeakable joy. Then Savvas decided to submit himself at the Monastery of Saint John the Forerunner beyond the Jordan, to the surprise of the monks there, and he took upon himself the obedience of ecclesiarch. There he worked many miracles, to the point that even lions obeyed him. But because he had seen an angel in a vision urging him to return to his own land, he felt compelled to make the journey back, to the sadness of the brotherhood. Passing through Jerusalem and Damascus he came to Antioch in Syria. Along the way he came across a woman with her dead child in her arms. Seeing her tears and hearing her entreaties, he raised the child from the dead. To avoid the glory of men for this miracle, he took another road and left. A similar miracle was done by him along the way. By ship he arrived in Crete, where for two years he lived in the deserted mountains in a supernatural way, and there he became ill. Then he went to Euboea, the Peloponnese, Athens, Macedonia, Thrace, Heraclea and Constantinople, where he took up residence in the Monastery of Diomedes. There his fame could not be hid, and he was even sought after by Patriarch Isaiah and Emperor Andronikos II Palaeologos. He was asked to sign a correct confession of faith, which made everyone honor and magnify him. As was characteristic of him, he decided to flee the admiration of the world. He returned to the Holy Mountain and lived at Vatopaidi Monastery. There he broke his years of silence and became a chanter, reader, ecclesiarch, server in the dining room and nurse. He became acquainted with Saint Philotheos Kokkinos, to whom he revealed his numerous spiritual experiences. The Fathers of the Monastery, in appreciation of the sanctity of Savvas, wished to honor him with the office of the priesthood, but, when they realized that he declined the honor out of humility, respected his refusal. While at Vatopaidi he had many divine manifestations and angelophanies. At the time of the civil war (1341-1347), the Vatopaidi fathers pressed the Saint to take part in an embassy to Constantinople, with a view to putting an end to the civil strife. Although the mission was a failure, as previously predicted by the Saint, he remained in Constantinople for six years at the Monastery of Chora. During this time he harshly criticized Emperor Andronikos for rousing the Zealots of Thessaloniki and causing bloodshed. He also contributed in the time of the controversies over Hesychasm to the victory of Orthodoxy, going so far as to predict the condemnation of Akindynos. However, when the Emperor John and the Church leaders attempted to persuade him to become Patriarch, Savvas out of great humility and in a cunning manner avoided his elevation to the patriarchal throne. His biographer tells us that Savvas acquired all the virtues and had angelic purity, and before the end of his life knew when his departure would be. He reposed in Constantinople around 1349. 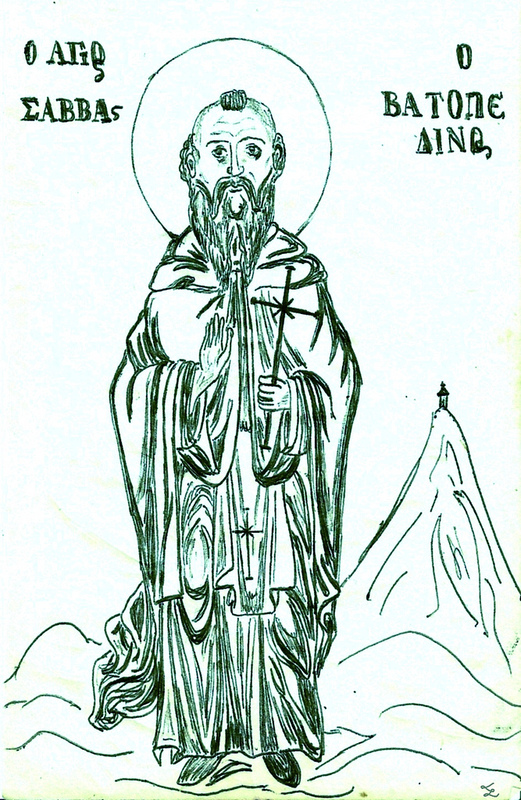 The excellent biographer of the Saint was Saint Philotheos Kokkinos (Oct. 11), who praises him in an excellent way, and this biography was the cause of much inspiration to Athonite monks for many generations, and it can be found in numerous manuscripts. It is reported that in 1840, when repairs were being done to the place where the bones of the reposed fathers are kept at Vatopaidi, the bones of a certain monk were discovered that had a beautiful fragrance. He was given the name of Eudokimos. The ascetic James told the brotherhood that this was Saint Savvas, apparently after a revelation. Elder Daniel Katounakiotis says that Saint Savvas appeared to an elder of Vatopaidi, and he healed him of an illness, saying to him: "My name is not Eudokimos, but Savvas the Monk. However say to the fathers of the monastery to call me Eudokimos." His memory is celebrated on October 11, June 15, the Wednesday after Pascha with the Fathers of Sinai, and on July 10 with the Fathers of Vatopaidi Monastery. A complete Service of Praise was composed in his honor by Dr. Tzelepis.